David Bergman is a professional sports and celebrity photographer, and he begins this tutorial with a simple reminder: “Your camera’s AF system needs light to focus.” In just two minutes, Bergman demonstrates the simple trick of using the AF assist beam of an on-camera flash, to dramatically improve your batting average when shooting in dim conditions. 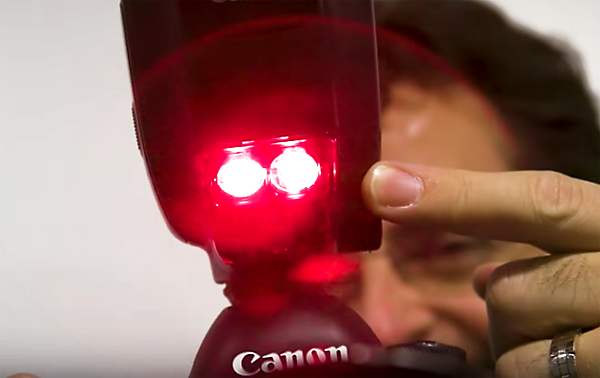 The AF assist beam is that red grid pattern emitted by a flash unit, and it can be a real lifesaver in achieving accurate focus, IF you use it correctly. And that’s what you’ll learn to do in this episode of Bergman’s Two-Minute Tips on AdoramaTV. As Bergman explains, your focus point needs to be on or near the middle of the frame for this technique to work properly. That’s because the AF assist beam is ineffectual around the edges. It’s also important that you select the correct mode on your flash. Bergman also demonstrates a few other uses for the AF assist lamp, including how you can use it to improve focus without actually using the flash to illuminate the scene. We bet that after watching this video, using the AF assist beam will become one of your favorite tricks. You can find more helpful tips on the AdoramaTV YouTube channel. And be sure to check out another tutorial from Bergman we posted recently, explaining how to take great sports photos by panning with your camera.